Contact us today to begin planning your event! Be Adventurous! Let us tailor a group event to fit your needs! Welcome to Segway • Bike Tours & Bike The Rabbit! We offer a wide variety of services for groups. Bike The Rabbit is centrally located in Greenville SC. We are able to provide on-site team-building events at hotels, corporate offices, and in public parks. Our group events are great for corporations, weddings, family reunions, church functions, and virtually any group scenario. Your options are as limitless as your imagination. Get some ideas from the activities below, mix and match them, or simply ask us to create something specially for you – whatever you need, we can make it happen! 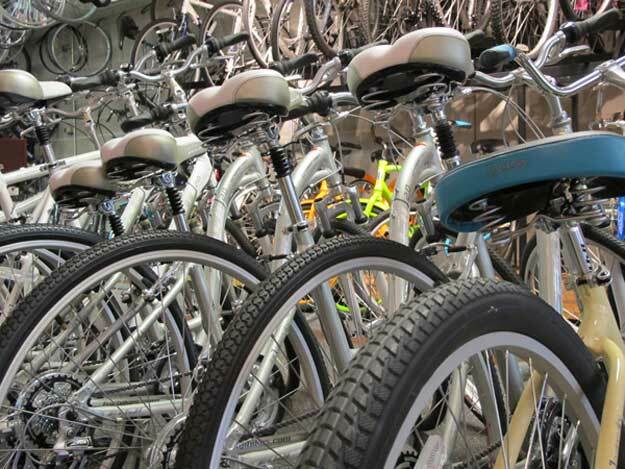 • Guests will travel around Greenville (or other local areas in the region) on bicycles to complete a scavenger hunt collecting the answers to carefully prepared questions. Questions can be composed around themes based on the client’s needs. • Greenville s taking its place among the ranks as a hub for craft beer.This is a great group event and allows individuals to get to know their teammates in a social environment. • Hoops Star Basketball – See which team can score 10 points first on Segways – a fun twist on a classic American game! • Beach Ball Bump Volleyball – can you keep the beach ball in the air on a Segway? • Lights Out – transfer the flames on small candles to your next teammate by Segway without the flame going out. • On A Roll – which person will get the furthest on a Segway without breaking the tissue chain? • Musical Segway – round and round you go until the music stops! Engage all of your senses while getting an insider’s look at Greenville’s history-soaked suburbs — from sprawling parks and majestic mansions, to filling cornbread and tasty chicken wings. We travel by bicycle past beautiful architecture, down mature tree-lined streets and through a trendy arts district while regularly stopping for mouth-watering local eats. Click for more information. Greenville s taking its place among the ranks as a hub for craft beer.This is a great group event and allows individuals to get to know their teammates in a social environment. Engage all of your senses and get an insider’s look at Greenville from a bicycle – from sprawling parks and tree-lined streets, to cornbread and chicken wings. **This tour is also available by Segway! The Segway Challenge is a Segway relay race designed to engage large groups. Participants compete against one another to finish an obstacle course. During the relay, participants will work together to succeed in fun challenges such as completing a part of a puzzle. This event can take place indoors or out doors. Guests will travel around Greenville (or other local areas in the region) on bicycles to complete a scavenger hunt collecting the answers to carefully prepared questions. Participants will have to carry items on a tray without dropping or spilling while maneuvering on a Segway. Take the teamwork element of this challenge a notch by adding a blindfold and letting teammates direct the Segway driver! These events are carefully crafted with safety in mind!